More recent filler tube guide. Often the helium canisters used to inflate the balloon have a standard “party” balloon nozzle which when bent release helium. However the nozzle is to small for the neck of a radiosonde balloon so an adapter needs to be built. 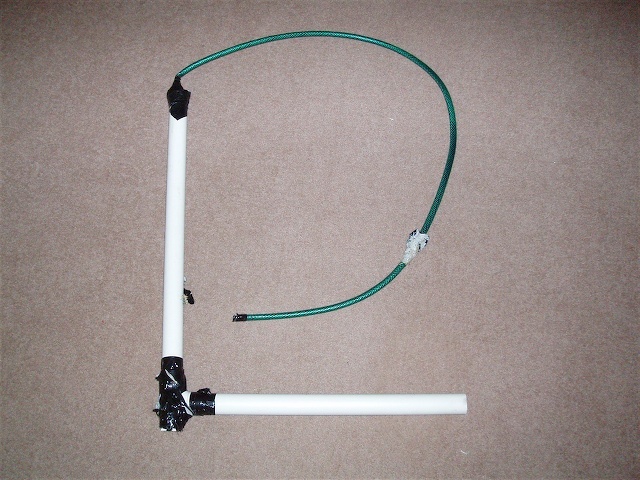 Its a long bit of hosepipe tubing (which will fit over the party balloon nozzle - with a couple of wraps of duct tape to hold it in place) which is fed into a rightangle of plumbing piping which the balloon neck can fit over. One end is sealed - in this case its a rubber suction cup (from an old bike rack that goes on the back of cars) that fitted over the end with a hole for the hosepipe to go through in the centre. This is all finished off with lots of duct tape to hold everything in place. The hosepipe goes all the way through the right angled pipe to about 10cm from the top. Begin right angled means that you can easily hang a weight off to calculate how much helium is required but remember to also weigh the pipe so that it can be factored into the total weight. The diameter of the large pipe is 43mm across and the radiosonde balloons seem to fit this nicely (I've tried both 200gm, 500gm and also 1200gm). While filling we use one or two cable ties to keep it in place during filling and also tie a safety line from the filler to the helium tank to stop everything drifting away.